Muhammed Ali brought a larger-than-life personality to the often brutal and rarely articulate sport of heavyweight boxing. Refreshingly so for his world-wide audience, Ali was both witty and devastating as an opponent. “Move like a butterfly, sting like a bee,” said Ali. His fists moved as fast as his mouth, and he was a charismatic figure both in and out of the ring. Here both mouth and fists are fully deployed as he stands over his opponent, Sonny Liston, after delivering the knock-out punch. 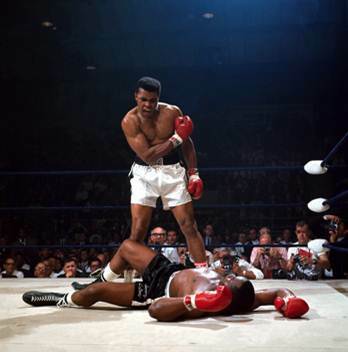 Neil Leifer’s famous photograph of the moment shows Ali still taunting the unconscious Lister in a moment of fascinating, almost animal, raw triumph. Leifer, Neil. Accessed 26 July 2010.